Richard Brautigan's wonderfully zany, hilarious episodic novel set amongst the rural waterways of America. Here's a journey that begins at the foot of the Benjamin Franklin statue in San Francisco's Washington Square, wanders through the wonders of America's rural waterways and ends, inevitably, with mayonnaise. 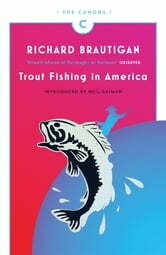 With pure inventiveness and free-wheeling energy, the counterpoint to all those angry Beatniks, Brautigan tells the story of rural America, and the hunt for a bit of trout fishing. Funny, wild and sweet, Trout Fishing in America is an incomparable guidebook to the delights of exploration - of a country and a mind.